WASHINGTON (CNN) -- Congress can force White House aides to testify under subpoena, a U.S. District Court ruled Thursday, rejecting Bush administration claims of immunity. Former White House Counsel Harriet Miers is not immune from congressional subpoenas, a judge ruled Thursday. 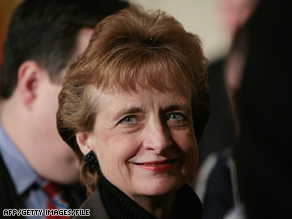 The House Judiciary Committee has been seeking to force former White House Counsel Harriet Miers to testify before Congress about the firing of nine U.S. attorneys in 2006. The White House has been resisting, claiming she cannot be compelled to appear. But the White House position "is without any support in case law," Judge John D. Bates wrote in a 93-page opinion released Thursday. He said the notion that "Miers is absolutely immune from compelled congressional process" is "unprecedented." But, Bates added, the ruling does not mean that Miers and Joshua Bolten, the White House chief of staff from whom House Democrats have demanded White House documents, could not assert executive privilege during congressional testimony. The court "resolves, and again rejects" the notion that senior White House aides are absolutely immune from subpoena, but the "specific claims of executive privilege that Ms. Miers and Mr. Bolten may assert are not addressed -- and the court expresses no view on such claims," Bates wrote. In a hearing in June, Bates had urged the White House and Congress to resolve their dispute via negotiations. He also expressed concern the clock would run out because he expected an appeal of his ruling no matter which way he decided. That could keep the dispute in the courts until a new Congress is elected in November. The subpoenas expire when this Congress leaves office. Rep. John Boehner, an Ohio Republican and the House minority leader, appeared to agree on Thursday. "I'm sure it'll be appealed and it'll go on into next year and it'll become a moot issue," he said. Rep. Lamar Smith of Texas, the senior Republican on the House Judiciary Committee, called the ruling a "victory for Congress," but urged congressional Democrats and the administration to "seek a reasonable compromise" rather than continue to fight the matter in court. The House Judiciary committee filed suit against Miers and Bolten in March after the Department of Justice said it would not pursue contempt charges against them for failing to obey the subpoena. The White House has insisted the firings of the nine U.S. attorneys were legal. But Democrats said the central questions behind the dismissals -- who decided the prosecutors should be ousted, and why -- remain unanswered. The position is supposed to be an apolitical one. Democrats accuse the administration of political motives in replacing the nine officials. White House press secretary Dana Perino said the administration is reviewing Thursday's ruling. House Speaker Nancy Pelosi, a California Democrat, said she was "pleased" by the ruling, though she said had not had a chance to study it.